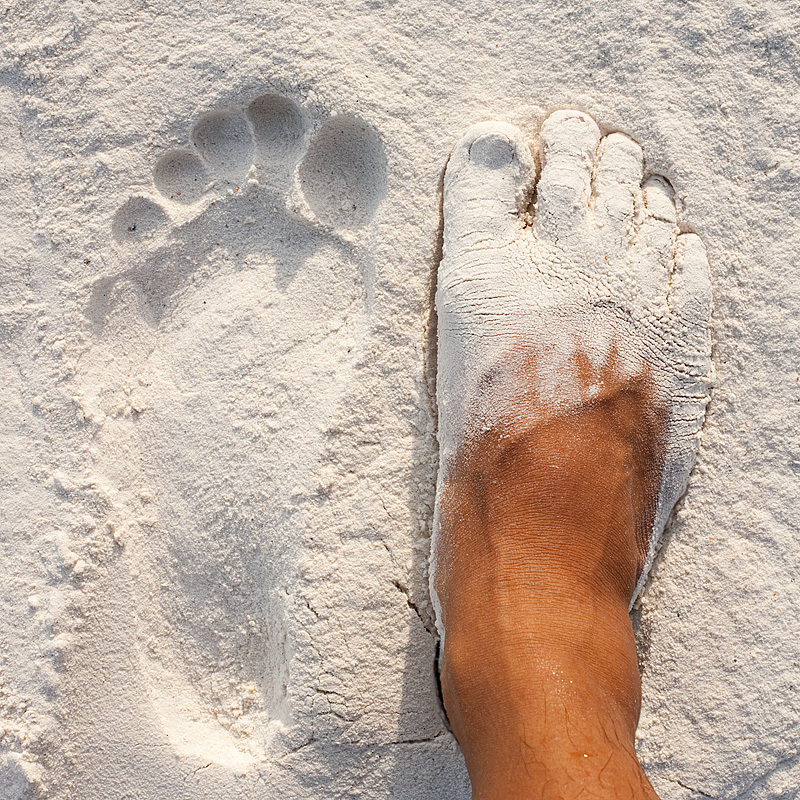 A footprint and a sand-caked foot on Ko Lipe's Pattaya beach. One of the reasons I return year after year to Ko Lipe is the crystal clear water. The other reason is the finest white powder sand I've ever seen and felt in my years of island hopping. By photographing my caked extremity, I hope to demonstrate the sand's resemblance to finely milled flour. If you can, for a minute, ignore a second toe that extends further than its brethren, you'll notice the sand's ability to fissure instead of crumble. In addition, my wet, mutant foot wouldn't be able to take a coat of this sand were it coarse like the sands found on other beaches in the world. Nearly the 2km length of Pattaya beach on Ko Lipe is partially covered in this powdery soft sand, most notable during extreme tidal fluctuations when super-low tide allows the recently washed up sand the ability to dry. Pattaya beach's white sand in front of Leepae Resort. 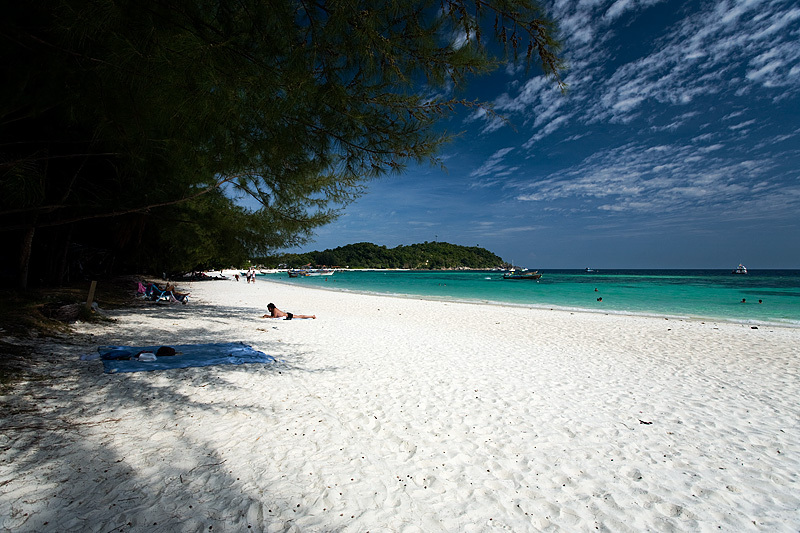 The idea of a "white sand beach" is immediately redefined once a visitor steps onto Pattaya beach in Ko Lipe. Tourists often take sand samples home to prove such fine powder actually exists. But may the gods have mercy on your soul if you manage to get this sand into any handheld electronics. Tourists often render their point and shoot digital cameras inoperable once the tiny particles of sand wedge themselves into the lens' moving parts. 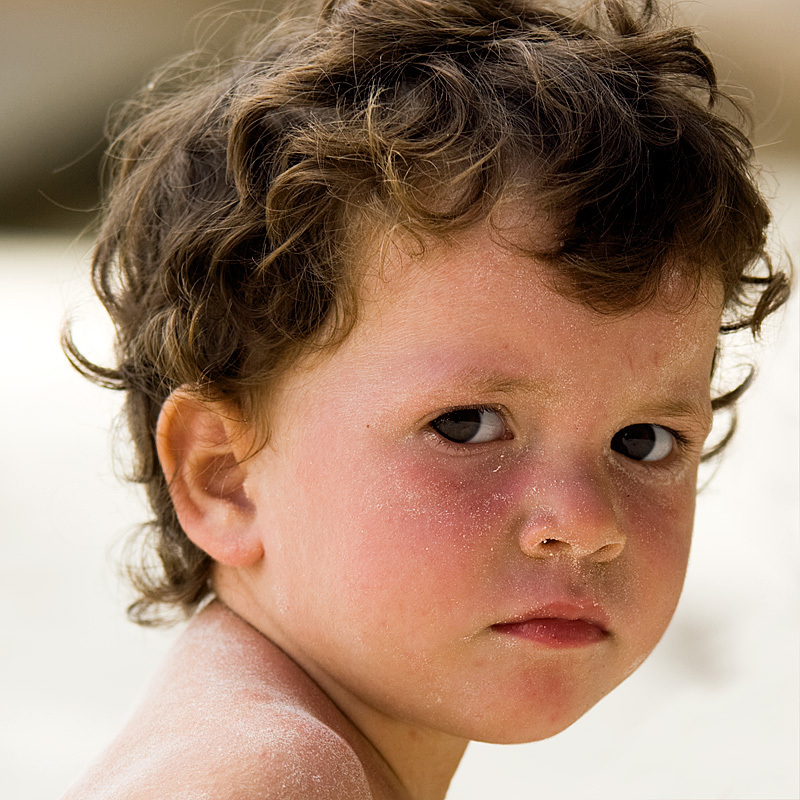 The sand speckled face of a young Spanish tourist. The final exhibit in my burden to prove the powdery nature of this fine white sand. My pint-sized Spanish friend, Lorella, is dusted in a sparse layer of Pattaya beach's sand. Imagine if you were to violently throw a handful of sand at a baby of any nationality. That baby would resemble our Spaniard, Lorella. Notice the individual particles of sand layering her shoulders and cheeks. If you get a chance, I recommend you never go to experience the sand of Ko Lipe. Once seen, all other beaches in the world pale in comparison. Often, mindful ignorance is bliss lest you want to gripe about every apres-Lipe beach you visit.